The Anna Wilcox and Harold Warnes Memorial Nature Sanctuary was part of a 160-acre land-grant initially awarded to David Wilcox by President Andrew Jackson in 1833 that was later passed to his granddaughter Anna. 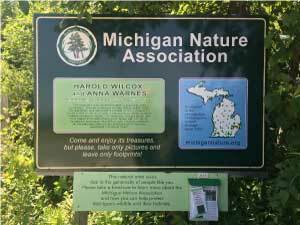 The 44 acre property was donated to the Michigan Nature Association in 1975 and was named the Wilcox Warnes Nature Sanctuary after Harold Warnes passing in 1976. The sanctuary is host to a wide range of wild and plant life. A 1 Mile trail goes through the property and fall offers the best time to see the beautiful colors of tulip trees which can be found throughout. Spring and summer bring a show of many different wildflowers and other scenery.